The increasing range of surgical specialty departments and rapid developments in the field of anesthesiology are reflected in our department. The medical and nursing staff administer over 6000 state-of-the-art anesthesias annually. Modern methods, differentiated monitoring equipment and up to date pharmaceutical drugs ensure the best possible safety during and after the surgical intervention. Additionally, it is especially important that our team be present for your personal care during and after the anesthetic. We will discuss with each of you individually, which procedure is possible and recommendable, as well as care and pain therapy after your surgery. Take the opportunity to ask us questions. Our experienced and competent team is here for you. They will see that your surgical intervention, the birth of your child or your pain therapy is experienced as far as possible, in a positive and relaxed manner. 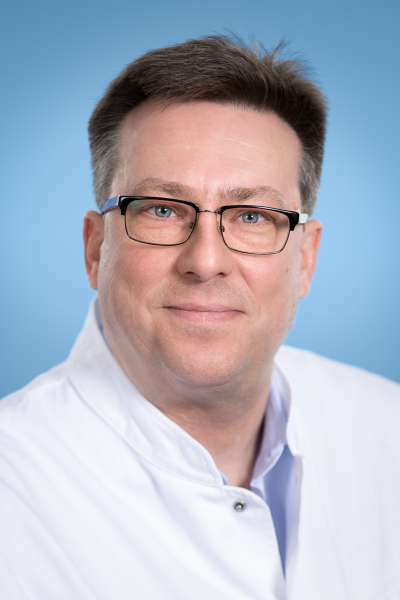 The Department Anesthesiology / Intensive Care / Pain Therapy is also responsible for the medical emergency management in Krankenhaus Waldfriede and trains hospital personnel in acute therapy for medical emergencies and resuscitation.